It's time for Lizzie's Birthday Blog Hop! Hopefully you already checked out day one with JESS, day two with DEE, and of course the main post from Lizzie. There are amazing projets to be seen and prizes to be won! This is day three! Happy Birthday to my sister from another mister, my twinnie, Lizzie! The first is a simple project that would be such an easy gift to make for someone (whether it be for their birthday or for the holidays). It's a picture frame made out of very cheap matierial - cardboard! The grogeous papers I used are from Authentique's "Gathering" collection aside from the blue woodgrain paper which is by Bella Blvd and it's called Family Dynamix - Roots. 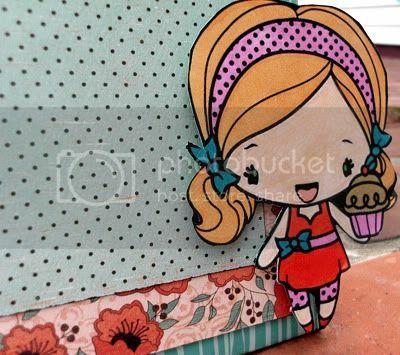 The adorable little girl is a digital stamp from The Greeting Farms named "Cupcake Anya" that I colored with my BIC markers. 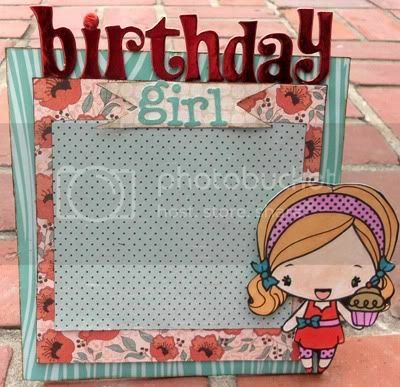 The word "birthday" is made up of Tinsel Thickers and the word "girl" is made up of cardstock stickers from Crate Paper's Emma's Shoppe Collection. I inked the edges with my all time favorite ink - Vintage Photo by Tim Holtz. 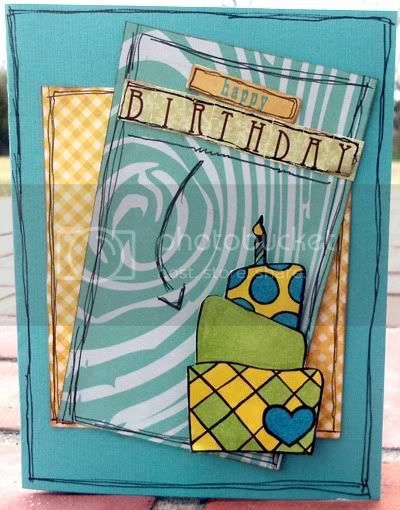 The second project is of course a birthday card! I kept it pretty simple. The base is your average Bazzil Cardstock. I once again used that same woodgrain paper from Bella Blvd that I mentioned before. The yellow pattered paper is from Authentique's Blissful collection. The cute little digitally stamped cake was made by our one and only, Lizzie! I colored it using my BIC markers. All the edges have been inked with Vintage Photo and I scribbled lines around each edge with my Zig Writer marker. The "happy" is a sticker from that same Crate Paper's Emma Shoppe sticker sheet and the "birthday" is made out of tiny alpha stickers from Bo Bonny's Vicki B. Collection. Now - it's giveaway time! 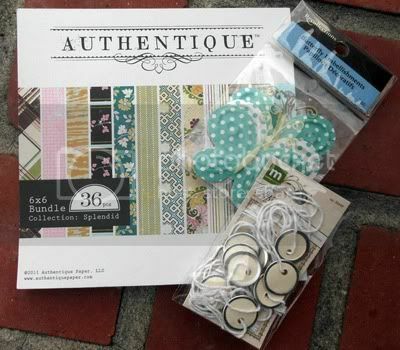 I will be giving away a 6x6 Authentique paper pad (the Splendid collection), a package full of the Vintage Finding's mini circle tags by Making Memories, and a package of Recollection butterflies. How do you win? Leave a comment on my entry over at Lizzie's blog. A winner will be randomly chosen. - Comment on THIS entry in my blog. Once again - Happy Birthday to the most wonderful girl in the world - Lizzie! Enjoy the rest of the blog hop, everyone. :) You'll hear from Carisa tomorrow! I am totally commenting! Yes, I am! Epic-ness on this blog! It has been so fun hanging with you at Tally and getting to know you! Love these projects! You are so creative and amazing!!! !